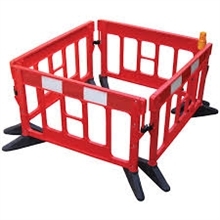 Titan Barrier is the recognised and well established stacking barrier - it has all the usual advantages of standard stackable systems but in addition has many unique features. One Piece Mould - Titan™ has been modified to a one-piece injection moulded design made from prime grade virgin Polypropylene offering sub-zero temperature and 2 year colour fastness properties. The new design is 100% metal free and fully recyclable. Reflective Panel - fully reflective panel meeting EN12899-2 requirements. Water Apertures - Water Apertures have been added to the one-piece mould so that when they are stacked they do not collect water within the frames and therefore do not add extra weight or inconvenience. 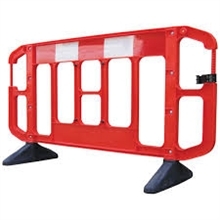 Flexi-Coupling Clips - this new linking facility enables easy connecting and compatibility with not only other styles of JSP barriers but also other brands. The clip can be conveniently retained to give added rigidity. Stable Feet - H.D. foot giving excellent surface grip. The unique design and excellent foot quality ensure that there is no need to purchase spare feet. Anti-Trip Feet - Titan™ has the option of having Anti trip feet which has a new scalloped design to prevent pedestrian/worker accidents. They are also painted in a high visibility yellow and featuring two reflectors per foot for extra visibility in low light situations. Stackable - the clever design allows for simple and practical storing, stacking, and unstacking. 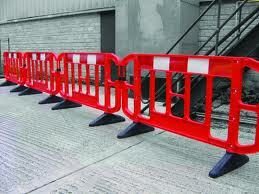 Contractor Branding - there is a large area to allow contractor branding details to be hot-foil or embossed. The one-piece mould can be made in any colour and a three-piece version can be made with different coloured end pieces to match a corporate identity. Even the feet can be coloured to suit. Toggles - branding/courtesy boards can quickly be attached using easy to lock and unlock toggles. Durability/Robustness – the barrier is left after moulding for 12 hours minimum - then a slowly driven 4000Kg Fork Lift Truck goes over it. 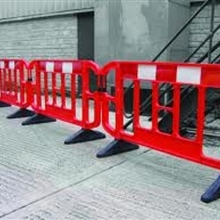 During this test the barrier does not break, crack, split or parts come away. Some minor damage/marking is seen but the barrier is still usable. Each production batch is tested to prove that the material is to our required specification.